On October 29, 2012 Hurricane Sandy - the largest Atlantic hurricane on record, hit land in New Jersey, and proceded to bring destruction to a highly populated areas of the USA. This hurricane's progress mesmerized me, friends and family in the eastern part of Canada were in its path, although it was expected to do less damage by the time it hit Canada. A quilter - Jennifer from Knotted Thread - put out a call for quilt blocks and set up a flickr group - she had family and friends who were seriously affected and wanted to bring them a quilt. Well, the response - from around the world - was overwhelming and fast, check out discussions in the flickr group. Those are the blocks I sent. Today Jennifer posted some finished quilt tops. The generosity of quilters the world wide is amazing. There are loads of ways to help more families affected by Hurricane Sandy. I think the fastest way to connect is to read Victoria at Bumblebeans's post here and look around her blog a bit, she has posted a number of other organizations who will get quilts to families in need. This is going to be a post of a bunch of somewhat random thoughts. That block above is called Diamond Ripples, from the Modern Blocks book, page 46 designed by Lara Finlayson and Toni asked for it in the Modern Blocks Bee. So I was wondering how that bit in the bottom corner was going to work in a quilt. Well, one can make a mosaic with your one block and see. I used the mosaic maker at Blue Huge Labs and set the space between the images to zero. Clearly Toni will have a wonderful quilt, one I was just not able to picture in my head at all. That block is for Marci in the Always Bee Learning Bee, it was designed by Malka Dubrawsky and is in her Fresh Quilts book. It is all Y seams, that was the learning part. Y seams are not hard at all, I think quilters need to totally stop worrying about them. If you want to see a tutorial about how to sew Y seams, Katie at From the Blue Chair just posted one today here, and she has a clever idea about how to mark the starting point too - she was sewing hexagons but a Y seam is a Y seam in the end and the technique is the same on any one of them. Before I ramble on about blogging, that is my first triple zipper pouch, made with Debbie from A Quilter's Table's tutorial here. I am going to make another tonight for my Scrappy Swap partner, this one has a few things I would like to do better. But seriously, 3 working zippers and pockets in one pouch. Christmas is coming, gifts are needed, just saying. I will show you some more pictures as I go. Do you get a lot of anonymous comments on your blog, and then a lot of emails about those comments? They are annoying and often try to sell me pharmaceuticals. In Blogger I went to the Design page, then to Settings, to Posts and Comments and then under the topic "who can comment" I changed it from "anyone" to "registered users". I believe that still lets most or all of the real people comment, but if you no longer can email me at shecanquilt [at] gmail.com (use the @ symbol). The anonymous comments are gone, totally gone. I highly recommend this change, it was actually Susan's suggestion and it works. And while you are there, in Settings, go to Other, and at the top you should see blog tools. Export a copy of your blog to your computer or a usb stick or drive. Then you will have a blog back up. Lately folks have made mistakes, had computer issues, etc. It takes a few seconds and then you are set. I am going to try to do it every month, as I do my monthly recap, and you should too. 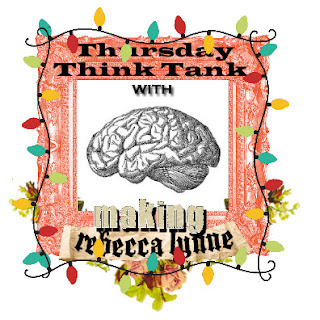 Today my friend Susan at Canadian Abroad is hosting the Thursday Think Tank which is Rebecca's regular link at Making Rebecca Lynne. If you have been doing some thinking, on any thing - it does not have to be about the holidays - you can link that post, and then visit some others too. To visit the others, at least right now on Susan's blog, you need to click the "trouble linking up, try here" button and you will then see and can follow links of the folks who have linked. It would be fun if a lot of folks were to link a thinking post at Susan's and visit the others, pretty much every post has some thinking in it, especially if you are quilting. Do back up your blog, and give some thought to backing up your computer too. Love how the diamond ripples looks. Maybe I should take another look at that book again. That is some mosaic. Very cool! I am about to make the no anonymous switch myself. But what a good idea about backing up the blog. I think I'll get a usb stick. thanks! Fun blocks, and I would have never thought to look at the layout using a mosaic! I have Debbie's triple zip pouch saved, but haven't done it yet. Perfect Christmas gifts though. Thanks for the Blogger tips. Although I haven't been bothered by anonymous comments, I did save a copy of my blog! I do backup my computer regularly too! I get the anonymous/no-reply comments, but they just go straight to Spam and never get published - fingers crossed. Love that pouch! And that hexies split in three block. So cool. Want to do one! Thanks for the linky info. I need to change the message on my blog to reflect what you say here. Wow, 3 zips,that a great idea! That mosaic is intense and wonderful. It will be an epically beautiful quilt when it's all done. After a tangerine martini all I can say is good night. Love the mosaic you made of Toni's block - that's going to be so cool! And LOVE that you made my triple-zip! Very fun! I was really disappointed about the Modern Blocks Book, but now I think I should take a look at that wonderful block you made. What a lovely post with great reminders and links! That quilt is going to look stunning! Holy, you are doing some serious thinking!! Thank you very much for the registered users tip - I'm going to do that straight away. I love your quilted triple zip pouch and will check Debbie's tutorial for sure. Thanks for the useful links today! Bighugelabs has some very handy tools doesn't it. That block will look great as a quilt. I had so many anonymous comments it was driving me crazy, so I changed the settings a few weeks ago, so much better! Loads of good stuff Leanne I also changed settings a few weeks ago and it has solved the anonymous comments that were driving me nuts. Great advice on the blogging stuff I am new to it so really helpful and I think I need to make that triple zipper pouch. Yours is adorable.